This Saturday we wish to tell you about a 5 carat fancy vivid blue diamond named "Ai"; the Chinese word for love; which could set a new world record when it hits the auction block at Sotheby's Magnificent Jewels and Jadeite event in Hong Kong on October 3. Sotheby's has estimated that the richly colored step cut gem will sell in the range of $12.4 million to $15.2 million, potentially putting the price per carat at $3 million or more. If The Ai Diamond outperforms Sotheby's estimate, it will be ascending into the rarefied air occupied by two of the most famous blue diamonds of all time. Back in May of 2017, the “Oppenheimer Blue”; a 14.62-carat fancy vivid blue diamond; fetched an astounding $57.5 million at Christie’s Geneva. 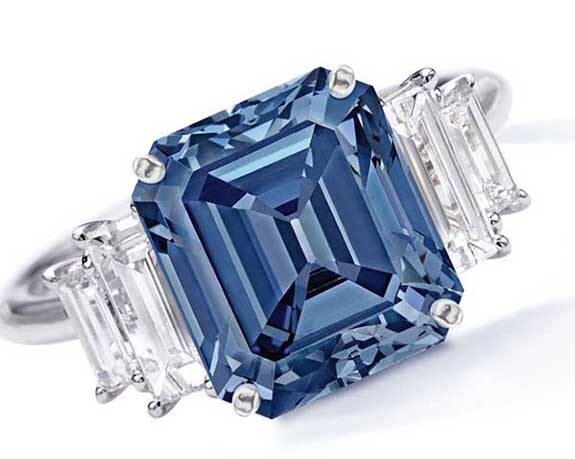 The Oppenheimer Blue’s per-carat price of $3.93 million came up just shy of the record of $4.03 million held by the 12.03 carat Blue Moon of Josephine, another magnificent blue diamond that sold for $48.5 million at Sotheby’s Geneva in November of 2015. It was the highest price per carat ever paid for a diamond or gemstone. “Fancy Vivid” is the ultimate color classification for all fancy color diamonds. Those displaying lower levels of color saturation may be rated “Fancy Intense,” “Fancy,” “Fancy Light” or “Light,” according to the Gemological Institute of America (GIA). Blue diamonds owe their color to the presence of boron in the chemical makeup of the gem. The Ai Diamond, which earned a VS 2 clarity rating from the GIA, is framed by white baguette diamonds and set in 18 karat white gold. • A Spectacular Pair of Fancy Vivid Yellow Diamond and Diamond Pendant Earrings Estimated to fetch between $4.8 million and $6.1 million, these earrings are designed as double gourds and vines, each suspending four old European brilliant-cut fancy vivid yellow diamonds weighing 51.17 carats in total. 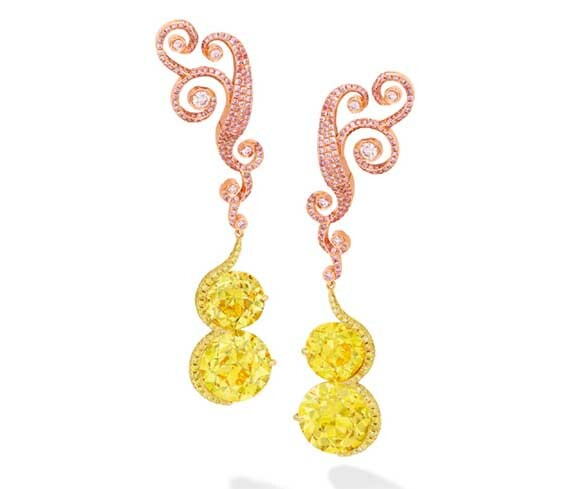 The earrings are embellished with pink and yellow diamonds mounted in 18-karat pink and yellow gold. 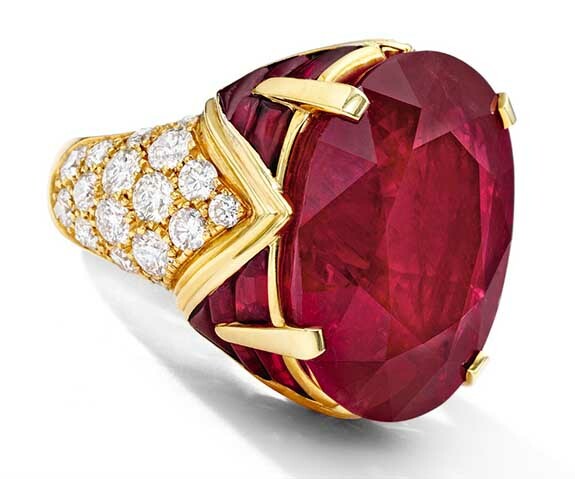 • An Impressive Ruby and Diamond Ring, Bulgari Set with an oval Burmese ruby weighing approximately 31.40 carats, this impressive ring by Bulgari is embellished with custom calibré-cut rubies and brilliant-cut diamonds on the shoulders. The setting is fabricated in 20-karat yellow gold. Sotheby's is estimating that the piece will sell in the range of $2 million to $2.5 million. 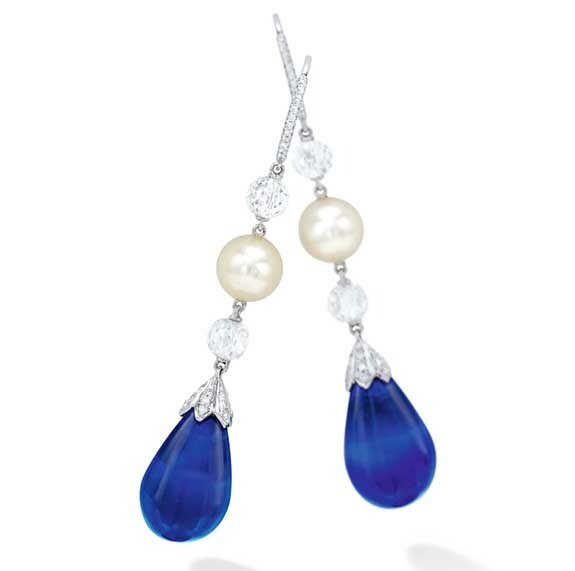 • A Unique Pair of Sapphire, Pearl and Diamond Pendant Earrings Drop-shaped Kashmir sapphires weighing 17.70 and 17.47 carats, respectively, dangle from these platinum and 18-karat white gold earrings. The earrings also feature button-shaped pearls and diamond beads, decorated with brilliant-cut diamonds. Estimated selling price: $1.6 million to $2.1 million.